© 2018 Back of Beyond. Located in the misty hills above Kandy, Weir House is a luxury boutique villa surrounded by lush tropical gardens as well as a cinnamon and tea estate. One hour from Colombo city and a short 40 min drive from Katunayaka Airport, is this spacious and lovingly restored colonial bungalow set within a 100 acre coconut estate. Right next to famous Sigiriya is it’s elusive sister Pidurangala rock. Blending deep into the 4-acre forest is our peaceful retreat dubbed ‘bird park’ by the villagers. Fourteen acres of green lawns, farmland and scrub jungle on the banks of the river as it falls to the sea… swim, walk and practice your yoga, rejuvenate and detox with our garden fresh produce. Fifteen minutes from the Yala National Park, our lodges combine the rustic charm of village homes with the typical open plan of wildlife bungalows. Throw in a rugged sea scape, rolling sand dunes, and great hosts….its becomes more than a safari. Magnificent ancient Stupas across a sheet of water, sublimely Sri Lankan. On the shores of Tissawewa Lake, in tree-filled garden is our elegant bungalow, just a few minutes from the sacred city of Anuradhapura. The magic of the wild, the care of village Sri Lanka. Tree houses and boulder cottages around the wild lily ponds, the stream in the forest, birdlife, natural fish spa, and…and an occasional elephant!! We opened our first Back of Beyond eco-lodge at Pidurangala to guests in 2007. 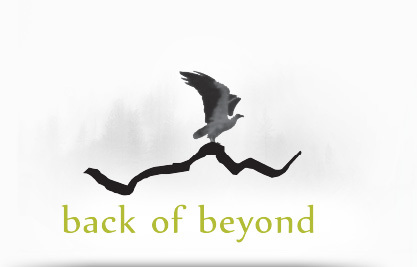 Today, our Back of Beyond properties have gradually increased to five. In addition, we have undertaken to manage another three bungalows which were built as personal holiday homes. We are glad to welcome like-minded friends and guests to these eight lodges and bungalows. The Sigiriya rock is probably the best landmark for our two Back of Beyond retreats in Pidurangala and Dehigaha ela. Back of Beyond Pidurangala hides in the forest at the base of Pidurangala rock, a mere 5 minutes from Sigiriya. Back of Beyond Dehigaha Ela on the other hand is an unique open grassland ringed in by streams, trees and hills down a maze of red earth village roads. Moving up to Anuradhapura, on the banks of Tissawewa is the serene Water’s Edge Bungalow, looking out to the ancient city. Only a couple of hours drive from Colombo is the beautiful colonial bungalow - Diklande Estate located on a hundred acre coconut estate. The recently renovated holiday home boasts a swimming pool as well the trademark 'open to the sky' bathrooms. 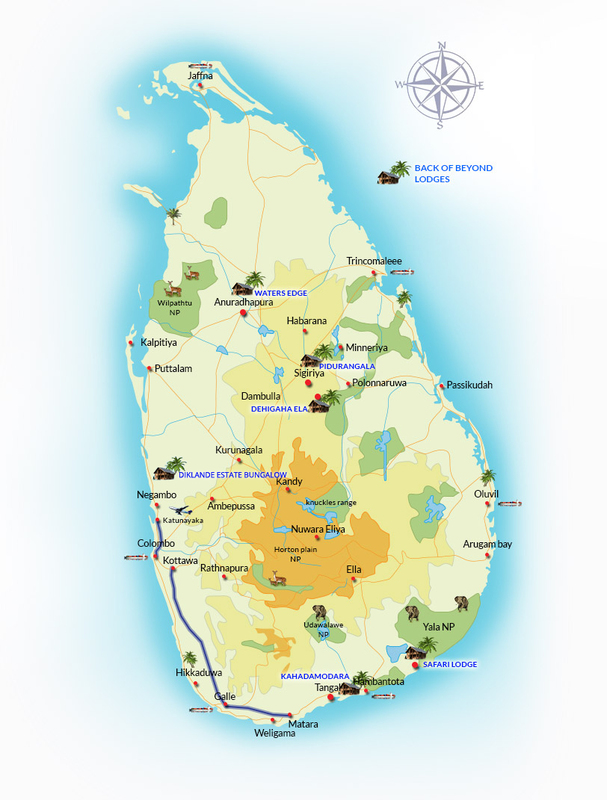 Deep down on the south coast, between Tangalle and Hambantota, is a little village on the estuary – Kahandamodara. Back of Beyond, Kahadamodara is on the banks of the Urubokka Oya river, just as it makes its way to the sea. Moving further along the coast, just 15 minutes from the entrance to the Yala National Park, are our little Back of Beyond Safari Lodge cottages And Our Sand Dunes Campsite. Our latest addition - Weir House, a favourite holiday home for the family set amongst the lush gardens within a working spice and coffee garden in the hills of Kandy is now open for bookings. © 2015 Back of Beyond.